Can’t get enough of Riley and Hayden? 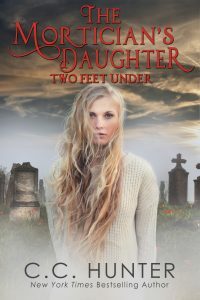 Did you love The Mortician’s Daughter: One Foot in the Grave? Looking forward to the next book in the series? Well, Two Feet Under will be out this Oct. 1st, and you can pre-order it so you will get it the minute it comes out. In book two, Riley finds herself in trouble up to her neck. And now that she’s figured out who Hayden is, can she help him recover so they can have a real relationship? On top of everything else, she discovers a secret that will shatter her world. Pre-order Two Feet in the Grave now at Barnes & Noble and Amazon. 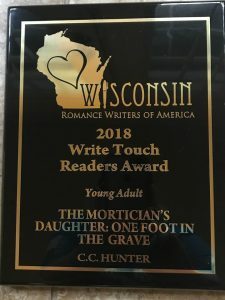 Have you read The Mortician’s Daughter? Order it today at Kobo, Indie Bound, Amazon or Barnes & Noble. LOVED the first book, and I’m so excited for this one! Why can’t it be Oct. 1st instead of July 1st?! I can’t wait!!! Wait so is it still October 1st the release date? Amazon says December 11th now and there is only a paperback pre-order and now goodreads says December 15th. Can’t wait to read this book! Sorry, but I had to push back the release date. It will be in Dec., just not sure of the exact date as yet. Will there be a third book? Just finished the second one and I’m in need of a third book for this story! Absolutely! I hope to have it out this summer, and it’s called THREE HEART BEATS AWAY. Just finished TWO FEET UNDER , and it was wonderful can’t wait for the third book do you have a date as to when it will be out in the summer? Would love and email with the info, I can’t wait. Sincerely, One of your biggest fans. I think the third book will be out in July.